This 14 day Gorillas and Masai Mara Safari combines some of the biggest highlights of East Africa. On this tour you will enjoy safaris in the world famous Masai Mara National Park and go gorilla trekking in Uganda. Look into the eyes of the last wild mountain gorillas– an experience you will never forget. This overland group tour also offers some spectacular natural landscapes, beautiful lakes, diverse cultural groups and you can even go white water rafting on the Nile river! This tour conveniently departs and ends in Nairobi in Kenya. 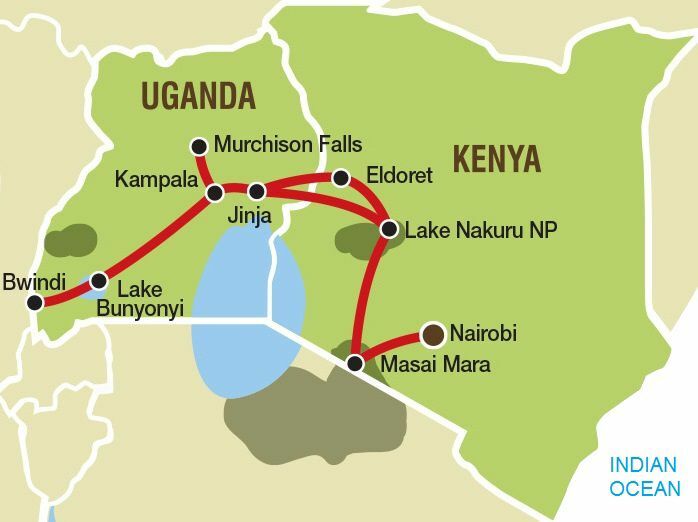 From Nairobi you can also join our 21 day East African Adventure (South). * The Gorilla Permit costs between U$ 630 - U$ 730 in 2019. The Gorilla Permit is a compulsory payment. Keep this in mind for your budget. Your gorillas and Masai Mara safari begins once we leave the capital of Nairobi and travel to the Masai Mara. The Masai Mara is world renowned for its endless plains of wild animals and spectacular beauty. The visit to the Masai Mara is operated in safari type vehicles and not the overland truck. For this reason, you are asked to pack a small overnight bag to travel with. You will need your towel, sleeping bag, clothes, toiletries and camping essentials. The rolling grasslands of the Masai Mara offer ideal wildlife viewing and photographic opportunities. Some of the other animals that could be found here include elephant, black rhino, buffalo, leopard, cheetah, wildebeest, zebra and gazelle. Hippo and crocodile abound in the muddy brown waters of the rivers, which traverse this reserve. Today we will spend the entire day on safari (game driving) through the Mara in search of all the animals. We rise early and enjoy our final safari through the Mara before heading to Lake Nakuru National Park, where we will enjoy an afternoon game drive through the park. Lake Nakuru is home to large flocks of flamingos and pelicans as well as black & white rhino, leopard, lion and numerous buck. Originally created as a bird sanctuary, Lake Nakuru was upgraded to National Park status in 1968. This is a special day as we cross the border into Uganda and we cross the Equator on our way to Jinja! Jinja is Uganda’s second largest city and most famous as the point where the Nile (officially the Victoria Nile) flows out of Lake Victoria and begins the 6695 kilometer journey to Egypt and the Mediterranean. After a quick stop in the city of Kampala, we travel in the direction of The Murchison Falls National Park. Also referred to as the Kabaraga Falls, Murchison Falls is a waterfall found on the course of the great Nile and are located within the Murchison National Park. The park is recognized as one of the best National Parks in Uganda. After settling into our accommodation in Masindi, your guide will brief you on the activities for the following day. Budongo Forest is the biggest Mahogany forest found in the whole of East Africa and is home to the largest number of chimpanzees throughout Uganda. It is believed that there are between 600 – 700 chimpanzees in Budongo and this morning we will meet up with our chimp guide who will take us on our trek through the forest in search of the chimps. We will also enjoy a safari drive through the park in search of the great diversity of wild animals. Please note: As the Chimp trekking is limited to 12 guests per trek, should there be more than 12 guests on a tour the trekking will be split between the morning and the afternoon. Therefore you may find that you will first do the game drive activity followed by the Chimp trekking or vice versa. Please allow for flexibility. We cross the Equator again en-route to Lake Bunyoni. Lake Bunyoni is a beautiful little lake with steep sides and abundant bird life. Ringed by mountains, the lake is best known for its dense otter population and stunning scenery. We make use of this beautiful spot to relax the night before the final drive to the gorillas. Should we not obtain permits to visit the mountain gorillas in Uganda then we will inform all passengers beforehand that the tour will travel to Rwanda or DRC. On your open day (when you don't visit the gorillas) in Bunyoni you will have the opportunity to participate in certain optional activities. You can also go hiking or explore the area on a mountain bike. Today we set off on our return journey to Kampala and make a third crossing of the Equator along our way. Tonight your guide will brief you on the activities available in Jinja so that you can plan your day tomorrow. We overnight in Kampala and enjoy an optional dinner out. Returning to Kenya we visit Eldoret, the country’s 5th largest city. The Great Rift Valley is still the dominant geographical feature of this region and the altitude at Eldoret is 2100 meters above sea level. We return to our final destination of the tour. Nairobi is the largest city in the East Africa region and there is an optional dinner, where we can swap stories and exchange contact details. Your tour ends upon arrival in Nairobi. Please note: The itinerary is flexible and can be changed without notice in order to accommodate the best possible viewing of the Gorillas. The Permit price to visit the Gorillas can also change without notice.